WBCSSC Notification is out. WBCSSC is recruiting for 591 Group C and Group D Post Posts. You can check WBCSSC - The West Bengal Central School Service Commission last date, download WBCSSC notification, visit WBCSSC official website and check other WBCSSC Vacancy details.Complete Vacancy and recruitment Details about 591 Group C and Group D Post vacancies in WBCSSC are provided below by JobSarkari.Com only for you. General / OBC-A / OBC-B Rs.200/-. Rs.150/-. SC / ST / PH Rs.150/-. Rs.100/-. 29 07 04 24 08 72. Assistant 39 39 25 58 27 188. Compositor 03 01 01 02 01 08.
man 01 00 00 01 00 02. Pressman 02 00 00 01 00 03. Boy 02 01 00 01 00 04. Sorter 02 01 03 03 02 11. 81 20 17 56 14 188. Durwan 26 08 04 18 05 61. Farash 04 02 01 04 01 12. Sweeper 13 05 06 03 04 31. Majhi 00 00 00 01 01 02. Attendant 04 01 01 02 01 09. Total No of Post 206 85 62 174 64 591. Technical Assistant Gr.-II Candidate Must Have Graduation in Science or 12th in Science With Technical Qualification Such as L.C.E / L.M.E / L.E.E / D.L.T.C or Diploma in Technical Education. Junior Assistant Candidate Must Have Passed Class 12th. Junior Compositor Candidate Must Have Passed Class 08th With Proficiency Certificate. Junior Machine man Candidate Must Have Passed Class 08th With Proficiency Certificate. Junior Proof Pressman Candidate Must Have Class 08th With 16 Year Experience in Relevant Field. Junior Fly Boy Candidate Must Have Class 08th With 16 Year Experience in Relevant Field. Junior Sorter Candidate Must Have Class 08th With 16 Year Experience as Library Attendant. Junior Peon Candidate Must Have Passed Class 08th. Junior Durwan Candidate Must Have Passed Class 08th. Junior Farash Candidate Must Have Passed Class 08th. Junior Sweeper Candidate Must Have Passed Class 08th. Junior Majhi Candidate Must Have Passed Class 08th. Junior Press Attendant Candidate Must Have Passed Class 08th. 2.Click on the Apply Online Link given in Important Link Section Given in Important Link Section. 6.Online Application Form Can be Submitted on or before 20th July 2018. Q. What is the Last Date For WBCSSC Group C and Group D Post Vacancy ? A. 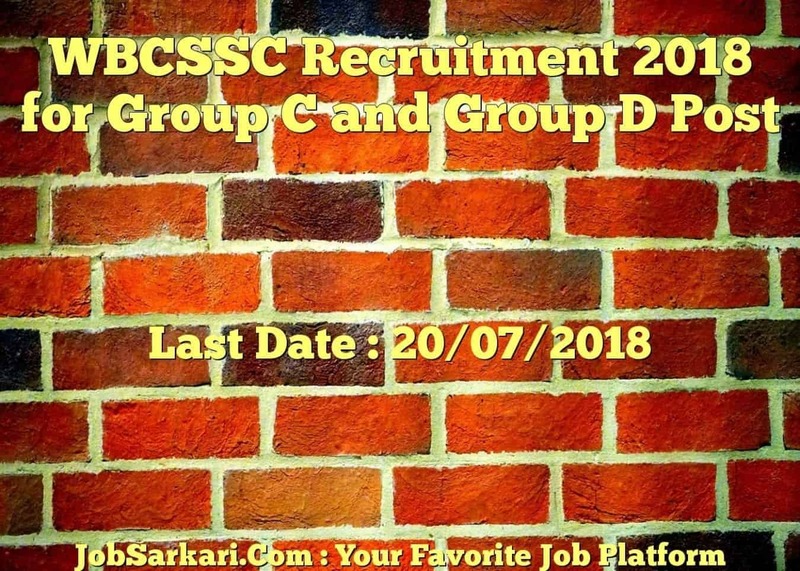 Last Date for WBCSSC Group C and Group D Post Posts is 20/07/2018. Q. What is the Form Type of WBCSSC Group C and Group D Post Recruitment ? A. The Form Type for WBCSSC Group C and Group D Post Posts is Online. Q. How many vacancies are available in The West Bengal Central School Service Commission Group C and Group D Post Posts ? A. There are about 600 Vacancies in The West Bengal Central School Service Commission Group C and Group D Post Posts. Q. What is the Full Form of WBCSSC ? A. Full Form of WBCSSC is The West Bengal Central School Service Commission . Sir,I have 12th pass.jobs related save to my profile. You Can Apply for All 8th Pass Job Through This Link. Pls help me to give me a job if possible. you can visit our Official Website for More Jobs. You Can Apply For this Post Through Apply Online Link As Given on Our Website.